A brass necklace decorated with two seated Nommo figures. The arms and legs of the figures are serpentine like; the arms are both raised. Their heads are elongated. 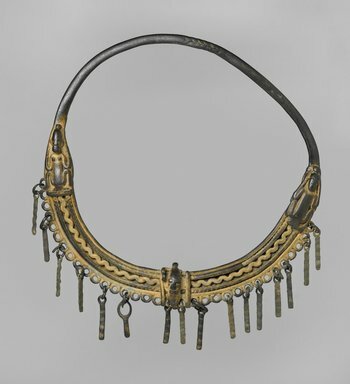 At the center of the necklace is another head. Sixteen small rectangular pendants are suspended from the front of the necklace. CONDITION: Generally good. One pendant is missing from its ring.